It began in the Spring of 2012. We had just purchased a home in the south metro of the Twin Cities, and were driving around our new neighborhood. We drove past the kids’ school and found a couple of city parks within walking distance. Then, we passed a sign announcing the registration window was open for youth lacrosse. At the time, Nick and I possessed little knowledge of the sport. It was simply a scene from the first American Pie movie, and a sport played on the East Coast. But we were in search of a “community,” and an activity to enroll our then-5-year-old son. We had no idea what that moment would grow into. Four years later, Landen has progressed in skill and sportsmanship and works hard to continue to improve. He’s traveled to games and tournaments, consistently placing in the top 4 as a team, and befriending many a teammate from the area. It’s been a very worthwhile experience. Our own knowledge of the sport has progressed as well. In fact, it is the fastest growing sport in the state of Minnesota, and an exciting one to watch. Lacrosse has its origins in a tribal game played by the eastern Woodlands Native Americans and some Plains tribes in what is now Canada. The game was then extensively modified by European immigrants to North America to create its current collegiate and professional form. Even still, it was widely believed that the Europeans could not match the skill of the Native Americans. From our perspective, with Minnesota known as “the state of hockey,” many hockey players play lacrosse in the off-season due to its similarity to the sport. We’ve located black-and-white photographs of lacrosse teams from the mid-1800s, and the differences in the shape of the equipment is quite astounding. Back then, the sticks were enormous, almost resembling snow shoes. Today, the stick heads are shaped to allow for better handling of the ball. Plus, the early teams didn’t wear any protective gear. Lacrosse is a very physical contact sport, played with heavy balls and I am grateful the boys dress in full pads and protective helmets to play. Even with such a storied history, it wasn’t until the summer of 2001 that a professional field lacrosse league known as Major League Lacrosse (MLL) was inaugurated. 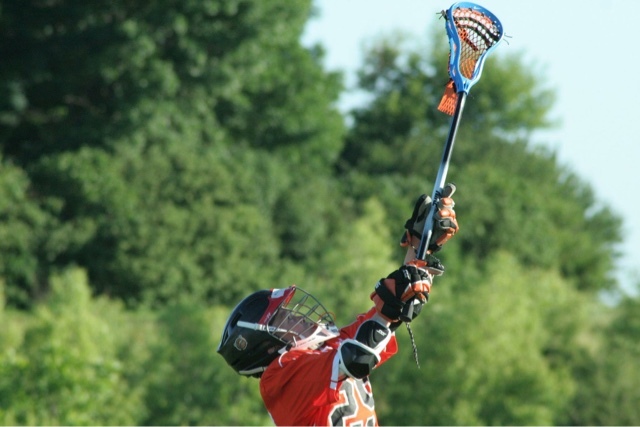 By age 9, Landen has played both Field and Box lacrosse. He played Box on full-size hockey rinks laden with turf, with much smaller nets than he was accustomed to. Then, in the summer months, he’s transitioned to Field lacrosse. Overall, the most important lesson we learned from the sport – beyond skills, fundamentals and sportsmanship – is to try new things. If not for a simple question-and-answer that day back in 2012, our lives would appear very different than what they do today.